Do you ever have days where you have big plans to get a lot done, and then end up feeling like a cat chasing it’s tail and getting nowhere? Today was like that for me. I went to a workshop this morning about science for little people, as our little Bear is just a wee bit of a mini-me-science-nerd, then came home and got busy sewing. I’m just about to get back into it for the #saturdaynightcraftalong, and then I realised, I haven’t blogged today!! 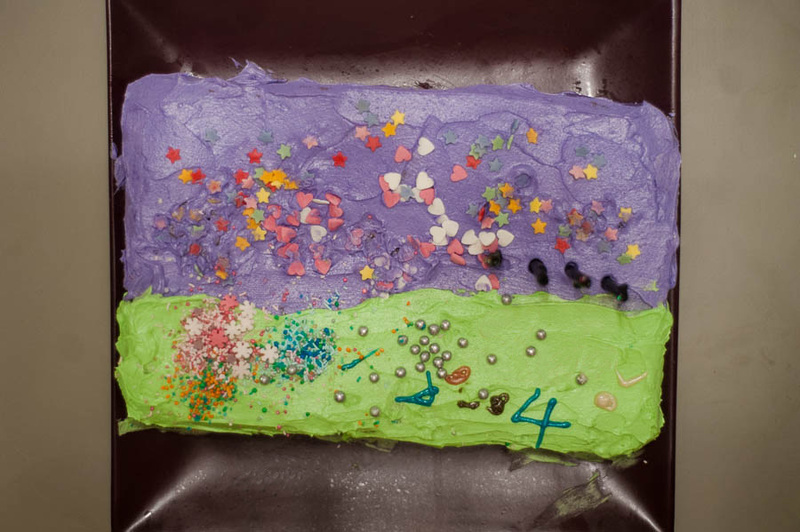 For Butterfly’s birthday (FOUR?? Silly me must have blinked! ), we talked about cakes, for a week. Her original idea was a castle, with horses and a Peppa Pig princess fairies. When I suggested we scale it back a bit, she said she wanted to help me make it. So the night before, I whipped up a chocolate cake (her chosen flavour), and then once the baby went down for a nap after an exciting morning of Big Sister Birthdaying, Butterfly & I set ourselves up and got busy – I mixed, coloured (under direction) and spread (again, under direction) the buttercream icing, and then she went to town with the sprinkles. I think that one is my favourite out of all the cakes you made this year. Hope you got some action shots!